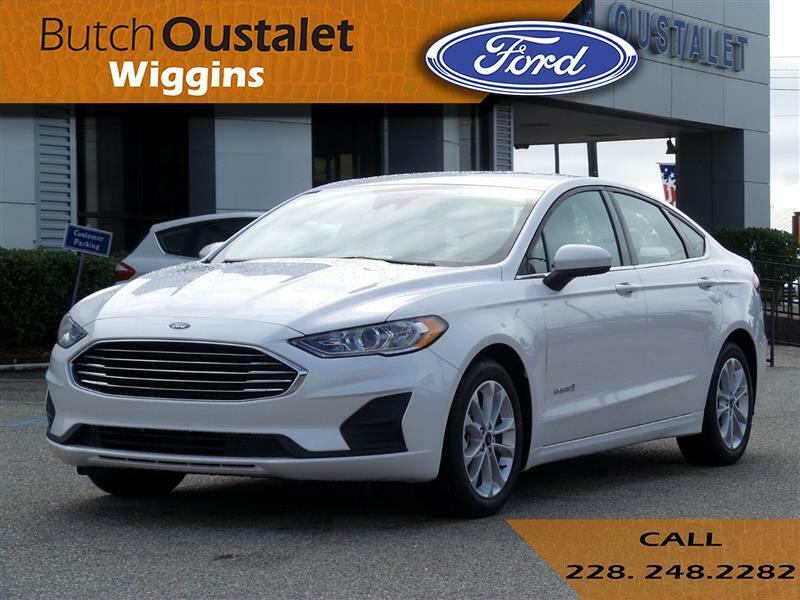 New 2019 Ford Fusion Hybrid SE for Sale in Wiggins MS 39577 Butch Oustalet INC. Think of the 2019 Fusion Hybrid as your companion taking on the road with sophisticated exterior design. New grille designs like the chrome mesh on Titanium and a five-bar chrome deliver a sharp, finishing touch, so you can turn heads with confidence. The Fusion Hybrid has an EPA-estimated rating of 43 city/41 hwy/42 combined mpg. Its 2.0L I-4 Atkinson-cycle gasoline engine and electric motor deliver 188 combined horsepower. SmartGauge with EcoGuide acts as a driving coach, providing real-time driving feedback. When your driving becomes more efficient, the right-side cluster display grows leaves and vines. You can track the powertrain’s operation – hybrid drive, electric drive, gas engine, plus instant and average fuel economy. Program #21010: Not all buyers will qualify for Ford Credit limited-term APR financing. Eligible vehicles will receive "Select Inventory" APR Financing. Vehicle supply is limited. Take new retail delivery from dealer stock by 07/01/2019. See dealer for complete details. (13488) Program #13488: Take new retail delivery from dealer stock by 07/01/2019. See dealer for complete details. (13486) Program #13486: $500.00 Ford Credit Bonus cash requires Ford Credit financing. Not all buyers will qualify. Take new retail delivery from dealer stock by 07/01/2019. See dealer for complete details. Truth in Lending Act Disclosure: Down payment will vary with APR and credit. For example, 0.0% APR with $2,500 down payment provides for 60 monthly payments of $16.67 per $1000 financed for qualified buyers. 0.0% APR for a term of 36 months corresponds to a monthly cost of $27.78 per $1000 financed. 0.0% APR for a term of 48 months corresponds to a monthly cost of $20.83 per $1000 financed. 1.9% APR for a term of 72 months corresponds to a monthly cost of $14.71 per $1000 financed. 2.9% APR for a term of 75 months corresponds to a monthly cost of $14.59 per $1000 financed. The rates described are for estimation purposes only; you may not be able to finance at this rate. Message: Thought you might be interested in this 2019 Ford Fusion Hybrid.